CodeDataPlate's helpful Inspector Guide for quick code references. 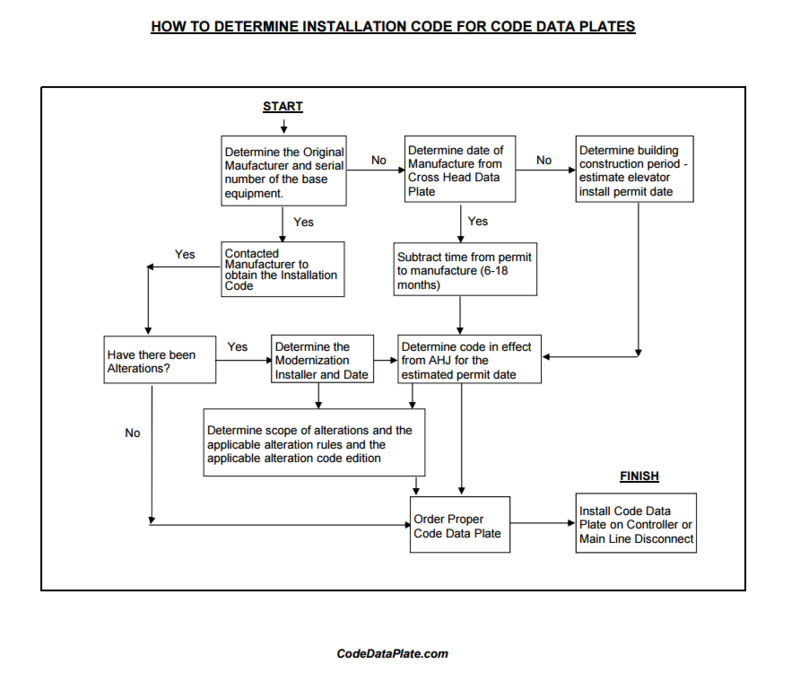 Codedataplate.com was formed to provide reliable and accurate code reference information to inspectors in the various AHJ's. Our professional staff is particularly knowledgeable in the areas regarding adopted codes of the various jurisdictions and in the requirements for alterations. We hold memberships in NAESAI, IAEC, NAEC and ASME as well as numerous other elevator related professional organizations and actively participate in educational sessions ensuring that the codedataplate.com logo in the lower right corner of our plates is your assurance of quality. Therefore plates provided by us will not have blanks for field added information. We require the Elevator Contractor (or customer) provide complete information before we fabricate the plate. This assures the inspector that qualified personnel have reviewed the information before the plate is fabricated. codedataplate.com publishes an Inspector Guides for Alterations Section 8.7 and for Part XII; for MCP requirements and for Alteration Testing. Auxiliary Power Lowering Operation: The rule came into the code with the 2000 edition. For Emergency Lowering installed under A17.1d-2000 and earlier editions we show this alteration as 1200.2(Emerg. Lowering). For this alteration under A17.1-2000 and later editions it is 8.7.3.31.9. Cab Work: We often see a lack of information on Cab Alterations. Please be aware there are a number of different alterations invoking different parts of the code. Further information may be found on our Custom Plates page or by contacting us. Controller Changes: We often see confusion in Controller Alterations. Please be aware these are 3 different alterations invoking different parts of the code. Further information may be found on our Custom Plates page or by contacting us. Very often the controller changes will include a change to or the addition of Fire Service Operation and if so an alteration to Emergency Service will need to be indicated. Jacks, Cylinders and Plungers: We often see these terms used interchangeably. Please be aware these are 3 different alterations invoking different parts of the code. Jack replacement is the entire assembly and requires conformance with all of 3.18 (302 in d-2000 and earlier editions). When just the Cylinder is replaced conformance is only required with specific parts of 3.18. Likewise is the case with just the Plunger. Further information may be found through our links or by contacting us. Main Line Disconnect: When the installation of a new Main Line Disconnect is part of an alteration it is covered under Wiring (1201.3, 1203.1c, 8.7.2.8 or 8.7.3.8). The controller rule applies only when the kind of power is changed coming to the controller (type, frequency, number of phases or voltage). Part XII Rules: Our custom alteration plates always use the rules from the 1996 edition for all alterations done under A17.1d-2000 and earlier editions. (Rule 1200.6 first appeared in the 1996 edition.) Generally rules will follow Table 1200 unless additional clarity is needed. Plunger Gripper: The rule came into the code with the 2002 edition. For Plunger Grippers installed under A17.1d-2000 and earlier editions we show this alteration as 1200.2(Plunger Gripper). For this alteration under A17.1a-2002 and later editions it is 8.7.2.23.7 [It can also be shown as 8.7.1.2(Plunger Gripper) for the A17.1-2000]. Pump Units: For the replacement of a Pump Unit we normally show an alteration to both Tank(8.7.3.29) and Valves(8.7.3.24), Pressure Piping, and Fittings. When a Pump Unit is relocated consideration must be given to its relative position to the top of the jack (1203.3f or 8.7.3.23.6). Restricted Door Opening: The rule has been in the code since the early 1980's. In A17-2000 and later editions the requirement is 8.7.2.11.5. In A17.1d-2000 and earlier editions there is not a specific alteration rule, however 1201.11 rules reference 111.5. We show this alteration by indicating compliance with 1201.11 or 1203.1k for hydraulic elevators or by showing it in more detail as 1201.11(111.5). Roller Guides: An alteration to the Roller Guides, or addition of Roller Guides can affect the operation of safeties. For these alterations are shown as alterations to car frames or counterweights. Section 8.7 Requirements: Our custom alteration plates use the requirements from the Alteration Code edition for all alterations done under A17.1-2000 and later editions. Generally requirements will follow Appendix L unless additional clarity is needed. The level of detail on our plates is a direct reflection of the level of detail provided to us. For example if the permit says replace controller we will indicate the more general rule which covers many possibilities. If more details are included we will also show the greater detail. Items not Covered in Part XII or Section 8.7: When an Alteration is made that is not specifically covered in Alterations we show it by 1200.2(description or rule reference) or 8.7.1.2(description or requirement). This states that the alteration has not diminished the level of safety below that which existed before the alteration and identifies what has been done. The two below are typical. Security Changes: These changes can affect may things, but are often permitted as a Security Change without further alteration information. We see these as an Item Not Covered [1200.2(Security Change) or 8.7.1.2 (Security Change)]. This change could affect the Fire Service Operation and if so an alteration to Emergency Service may need to be indicated. Skirt Deflector Devises (Brushes): A separate requirement was added in the A17.1a-2005 [8.7.6.1.5(d)]. For this alteration under A17.1d-2000 and earlier editions we show it as 1207.5c (an alteration to the Construction of Balustrades) and as 8.7.6.1.5(c) for this alteration under A17.1-2000 through A17.1-2004. Special Application Elevators: For Special Application Elevators and other equipment where there are limited alterations listed we typically refer back to the appropriate section in the main body of the code. Toe Guard: The extended toe guard requirement maybe triggered by 8.7.2.20 when a rope brake is added. Test Tags: Requirement 8.7.11.1.6 (8.6.1.7.2 in 2008 and later editions) requires a metal test tag with test data, person or firm performing the test and the application requirement to be installed. CodeDataPlate.com offers these tags for all periodic tests and also for acceptance tests.